Situated by the Calabar River, Tinapa is a business and leisure resort conceptualized to be an integrated business resort. It is a four phased development promoted by the Government of Cross River State, under a Private Public Partnership (PPP), and very close to Calabar Free Trade Zone. It is the realization of an exciting dream – the first integrated business and leisure in resort in Nigeria. Tinapa Free Zone has world-class facilities that enable visitors to engage in retail and wholesale activities as well as leisure and entertainment. Tinapa has space for retail and wholesale, several line shops, warehouses etc. It also has an open exhibition area for trade exhibitions and other events, a movie production studio commonly called “Studio Tinapa” or “Nollywood”, an entertainment strip that include a casino, an Eight-Screen Cinema, a children’s arcade, restaurants and a mini amphitheater, a night club and pubs. La Campagne Tropicana is a beach resort in the Ibeju Lekki area of Lagos State. It’s a lovely hour’s drive from Victoria Island along the Lekki/Epe Expressway, preferably early in the morning. This resort offers a unique blend of natural environments which include a fresh water lake, accessible mangrove forest, a savannah, extensive sandy beach and the warm Atlantic sea. The resort provides world class accommodation and a variety of activities to make sure you have an experience like no other on your visit. The staffs are professional and friendly and the cuisine is second to none with 24 hours security. Care has always been taken to make sure that the Infrastructure at the resort blends in perfectly with the surroundings so that the spectacular ambiance of the tropical countryside is not lost. It also has luxuriously furnished holiday/investment homes with highly cosmopolitan African Decor. All rooms are fitted with ultra – modern appliances such as air – conditioners, TV and wireless Internet Service etc. it is also located within 2 minutes’ drive of a 27 – hole golf course currently under construction. Awaiting you there are Spa treatments, massage therapy, fully equipped cardiovascular gym with personal trainers. Cultural dance displays for guests / residents, fresh palm wine bar with an excellent ocean view, fine dining in elegant restaurants and much more. Other activities include hiking, hunting, horse riding, canoeing, ocean water fishing, aqua aerobics, beach volleyball, and soccer. Obudu Mountain Resort is in Cross River State situated close to the border of Cameroon and is reached from Lagos by plane. It offers the leisure seeker and the conference goer a complete contrast. Not only in its temperate climate but also it’s exciting and different location. Nestling at the top of the mountain the Obudu Mountain Resort is situated on a plateau at 1576 meters above sea level on the Oshie Ridge of the Sankwala Mountains. The temperate climate offers a total contrast and welcome respite from Africa’s tropical heat. Idyllic tranquility, beautiful scenery and breathtaking views make it ideal for the lone adventurer, families on reunion, young couple or holiday group. The food and beverage offering is found in the Terrace Restaurant and Bar with a cozy and relaxing atmosphere made complete by the blazing log fire. National and international cuisine is guaranteed to suit all tastes and the healthy appetites from a day’s nature walk or round of golf. The resort provides accommodation in the form of African round huts and chalets on stilts maximizing the breathtaking views. It also offers self-contained suites varying in size from the 2-bedroom Governor’s Lodge with its own lounge/dining room and kitchenette to the 20 Mountain Villas, each with three bedrooms, lounge, dining room, kitchenette and balcony. There’s a fully equipped gym, two floodlight tennis courts, a squash court and a natural swimming pool. Keen golfers can show their prowess on the hotel’s 9-hole golf course. Located in the South-Eastern part of Bauchi, Yankari National Park is undoubtedly Nigeria’s most developed animal reserve and park. The park has the largest collection of Animals than any other park in the country. It currently hosts 50 different species of animals and about 550 elephants – the largest herd of elephants in West Africa. It’s best visited between February and late April. The Games Reserve also boasts of more than 59 caves, a well system used by slaves and Wiki warm spring. The spring water forms a pool which is 200m long and 10m wide, containing crystal-clear water at a temperature of around 31 degrees Celsius. It available for tourists to swim in. Yankari Park also has several archaeological preserves including the Dukkey Well System and the Ampara and Shanshau iron smelting works and furnace shafts dating back many centuries. MicCom Golf Hotels Resort is Nigeria’s only privately owned golf course with hotel facilities attached to it. 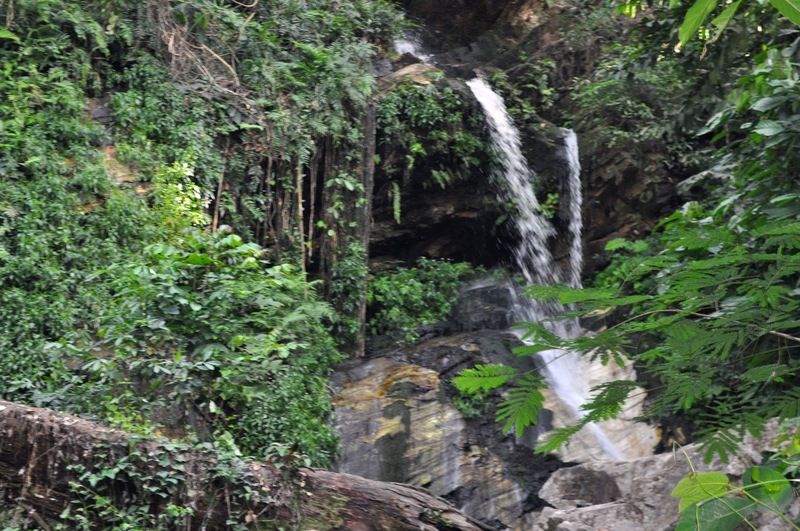 It is situated in the rustic town of Ada in Osun State. The course is set in the serene, picturesque location deep within the lovely and tranquil forests of the South-West. This tranquility is only broken by the musical chirping of birds. The hotel is set in the splendor of nature and the peacefulness and tranquility remains unbroken. The Golf course is set within the most natural hazards, and its every golfer’s delight. In the heart of Ikogosi, a small, quiet town with rich, local customs, in the Western part of Ekiti State (Ekiti Tourism Corridor), lies a warm spring which has now catapulted Ikogosi-Ekiti to national and international limelight. What is mysterious about the Ikogosi Warm Spring is the fact that, flowing side by side the warm spring, is another spring, a cold one. According to experts, it is a geological wonder to have such occurrence out of the same rock formation and this Ekiti flagship tourist destination is said to be the only one of its kind discovered anywhere in the world. The meeting point of the warm and cold springs is a unique attraction to tourists. In order to give tourists and visitors a long-lasting experience, a well-landscaped 116-hectare resort is located around the warm spring at Ikogosi-Ekiti. The resort has one Executive VIP chalet, three VIP villas, twelve western suites, seventy-five standard rooms of different styles, themes and offerings and seven support staff quarters. The historic Idanre hills are a marvelous tourist attraction in Ondo state. Located in Idanre town, 9 miles southwest of Akure, the state capital, Idanre Hills is no dreamland or imagery of sorts. Said to be 800 years old and reached by about 640 steps with 5 resting points on your way to the top, it is a breathtaking landscape that also provides a window to the town’s colorful history. From a few miles to the town center, a first time visitor will not cease to marvel at the aesthetics, architecture and thoroughness employed by nature in the assemblage of hills of various shapes and sizes at Idanre, also called ‘Oke Idanre’ by the locals. The evergreen landscape surrounding the hills provides fellowship with nature’s best. The peacefulness that pervades the atmosphere, the blossoming civilization that existed on the hills, the rigors of climbing and a refreshing swim in Arun River, all make the Idanre Hills a wonderful place to visit. If you are adventurous enough, the tallest of the hills which rises to about 300 feet above sea level, challenges you to a climbing game. Those who successfully dare the peak are rewarded with the very rare panoramic view of the topography at bird’s eye, which is a unique fortitude for ancient residents. The excitement takes you further atop of the hills to the Arun River, a small river on the hill. It is believed that a swim in the middle of the river “will result in an eerie, fuzzy feeling.” Arun River is crystal clear and one can see crabs and a few other aquatic animals, and adjudge the water’s friendly depths. The more adventurous can also dare the Agboogun Footprints, which is widely believed to enlarge or contract to accommodate every foot. The Mambilla Plateau is a high grassland Plateau which is a part and extension of the Adamawa, Obudu, Shebbi and Atlantic mountain chain. The Mambilla Plateau, which lies to the southern edge of Taraba State, is renowned for its rich scenic beauty. It stands at well over 1,830 meters above sea level and has a temperate climate with lush pasture green vegetation. The access route up the Plateau and the canyons is a breath-taking delight, with snake-like winding road that ascend the Plateau and natural springs that bore through rocks adorn the road. There is also is a spectacular bridge suspended over a valley. The Plateau is one of the few places in the federation where temperate plants like Apples, Pears, Arabica Coffee, Strawberries, Tea and Irish Potatoes grow very well. The whole area is Tsetse fly and Mosquito free with more than 2 million herds of cattle. The Chad Basin National Park is a delight for nature-lovers. Located in the Sudano-Sahelian ecological zone of the North-Eastern part of Nigeria between Borno and Yobe States, Chad Basin National Park covers a total area of 2,258 sq km and fragmented into three sectors. The Chingurmi-Duguma sector, which is in Borno State, is in a Sudanese Savanna ecological zone while the Bade-Nguru Wetlands and Bulatura sectors are in Yobe State in the Sahel ecological zone. The park which is generally referred to as the conventional basin of the famous Lake Chad, is indeed a veritable heaven of adventure where visitors are spoilt with activities that will make the spirit soar. The largest is the Chingurmi-Duguma Sector covering an estimated 1228 sq km in the districts of Gulumba and Woloji in the Borno state. The sector is made of large acacia woodlands and is dotted with dense patches of elephant grass in a stratified formation that adds to the natural beauty of the ecosystem. The sector has recorded 66 species of birds which include black-crowned crane, Aviles bustard, Demoiselle crane, Arabian bustard, African-collared dove, yellow-breasted barbet and much more. The Bade Nguru Wetlands is part of the internationally renowned Hadejia-Nguru Wetlands and it covers an area of 938 sq km. Situated southwest of Bade and Jakusko Local Government Areas of Yobe State, the focal point of the sector is the Dagona Waterfowl Sanctuary that is internationally significant as a host to migrant birds. This is one of West Africa’s most important stop-over points for birds migrating from Europe. It has been listed as an IBA (Important Birds Areas) supported by Bird-life International. Bulatura Sector is just a landscape of Sand Dunes in Yusufari town of Yobe State covering an area of 92 sq km. It is made up of a series of fertile dune depressions (swampy valleys) referred to as Oases and also includes highly scenic sand dunes that hold great potential for ecological and adventure tourism. The park contains some rare desert wildlife like giraffe, ostrich, red fronted gazelle, jackals, mongoose, giant tortoise, panta monkeys, porcupine, ratel, spotted hyena, common duiker, warthog, dorcas gazelle, sitatunga, varieties of waders, glossy ibis, pelicans, secretary bird, knob billed goose, etc. Owu Falls is always at its best during rainy season which spans 200 meters across making it a wonderful vacation spot. In Owu Falls, you experience a fine mix of awesome attractions and access to top quality accommodation as it offers a range of quality assessed accommodation with good quality restaurants. Its perfect location and memorable vacation experience makes it the perfect destination to host your next vacation. A fun filled and unforgettable vacation experience awaits you.